Our guest post comes from Howard Hian, who writes at Travels with Hian. Howard is a regular contributor to The Military Press, a California semi-monthly journal. His travel features can also be found online monthly at Travel Savvy News. Additionally, he is a regular guest commentator at On Tour with Dave and Carmel broadcasting from Sacramento, CA. How often have you attended a convention and only spent time in meetings, the elevator or your room? You know the drill: opening reception, next day chock full of seminars, big lunch, cocktails followed by dinner, then start over the next morning. Well, here’s an admission. At a recent conference, my wife and I played hooky and made a discovery: Atlantis. 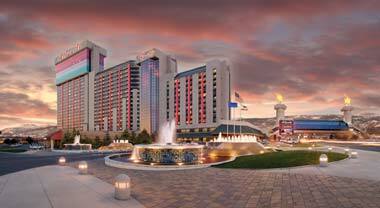 Not the mystical city of the Greeks, but the Atlantis Casino Resort Spa in Reno, Nevada. We had to plan our escape carefully. We started by wandering through the hotel for ideas. Since poker is a passion, the card room was a logical stop. Fortunately, there was a Hold ‘em tournament just beginning and a chair was open. 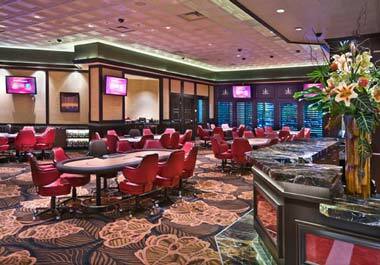 It was a $30 buy-in, there were nine tables and the participants were a mixture of hotel guests and regulars. Free coffee, water and soft drinks were available for the players, as well as a platter of donuts. The game began promptly and after a good start, including quad queens, by noon I was short-stacked. I shoved all-in with an ace-jack suited, but lost when the hand didn’t pair up. I finished out of the money (missed the final table by one) but it was an excellent start to the day. By that time, we were ravenous and we headed to lunch. The Manhattan Deli & Restaurant took good care of our hunger. It’s a traditional New York style deli with a huge menu and portions to match. Their not-to-be missed signature dish is the “piled-high” pastrami sandwich. It is served on thick-cut rye bread designed to better hold the giant stack of meat together. The classic New York cheesecake for dessert was sublime. All bakery goods are made in-house. Rightfully, the place has become a local favorite. We decided that a visit to the spa would be the perfect way to end our adventure. In 2010, the Spa at Atlantis was listed in the SpaFinders Reader’s Choice awards. Upon entering, we were transported to a zone of tranquility. We “took the waters” at the Aqua Lounge, then rested in the Laconium Relaxation area and finished with a superb hot-stone massage. Now we understand why the Spa won its award. Reluctantly, we realized it was time to end our getaway and head back to the conference’s closing ceremony. But I was content knowing that, in the course of our day playing hooky, we discovered Atlantis.